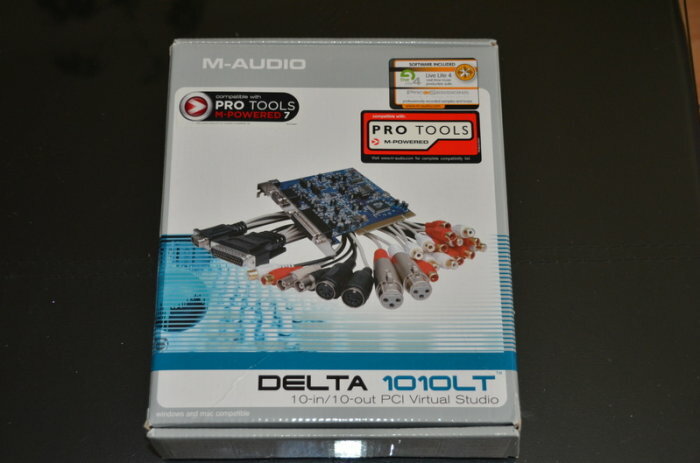 Delta 1010LT, Internal PCI/ISA Sound Card from M-Audio in the Delta series. ericthegreat's review"i prefer m audio's external sound cards"
The M-Audio Delta 1010 LT is a high powered sound card that will definitely do exactly what you need it to do for your home set up, it has a 24 bit/96.6 khz sound card that has eight analog inputs and outputs, SPDIF in and out, and MIDI in and out. And just the fact that this is made by M audio says enough. M Audio has always put products out that they stand by and offer great support for. 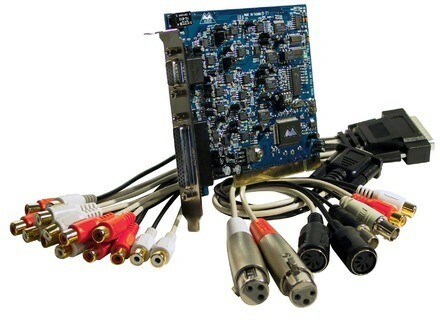 This card can record up to eight tracks simultaneously. Two of the analog inputs are XLR, allowing for direction connection to microphones. I have used this with windows xp and vista and there is some latency, but this may be due to my computer being older. I know latency is an issue with digital recording, which is one of the major reasons why I generally record on analog equipment. There are some issues with routing the hardware to the output but its nothing that will hold you back for too long. I have used this for quite some time and it is a great product for the money. The M Audio Delta 1010 LT is a card for someone that wants to do some good recording from home with there small set upt Most peoples first recordings come from home so this fits righ tin. I still could have transferred my sound files from a machine like the 788 into the computer, allowing me to mixdown in the computer, but I did not know then what I know now. Still, for someone who wants to do everything on the computer, and doesn't care about the potential for crashes, interrupted recordings, jitter, latency, but overall this is a great pc card if you are looking for a soundcard that is built in, but at the end of the day most of us choose to go with an external supply because they are easier to install. I suggest looking into M Audio’s External controllers. They will be way better. themaddog's review"Nice 8 Track Soundcard"
The M-Audio Delta 1010 LT is a 24 bit/96.6 khz sound card that has eight analog inputs and outputs, SPDIF in and out, and MIDI in and out. 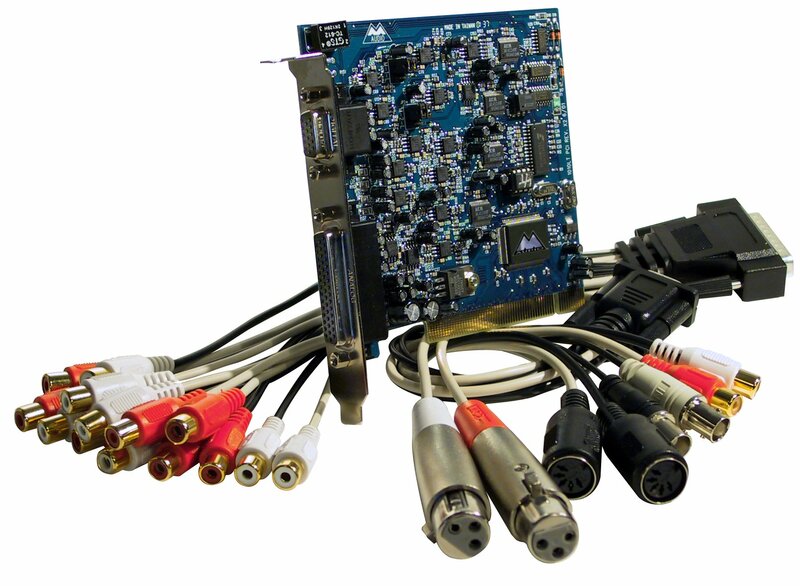 This card can record up to eight tracks simultaneously. Two of the analog inputs are XLR, allowing for direction connection to microphones, whereas the other six are through RCA connections. All of the analog outputs are RCA. 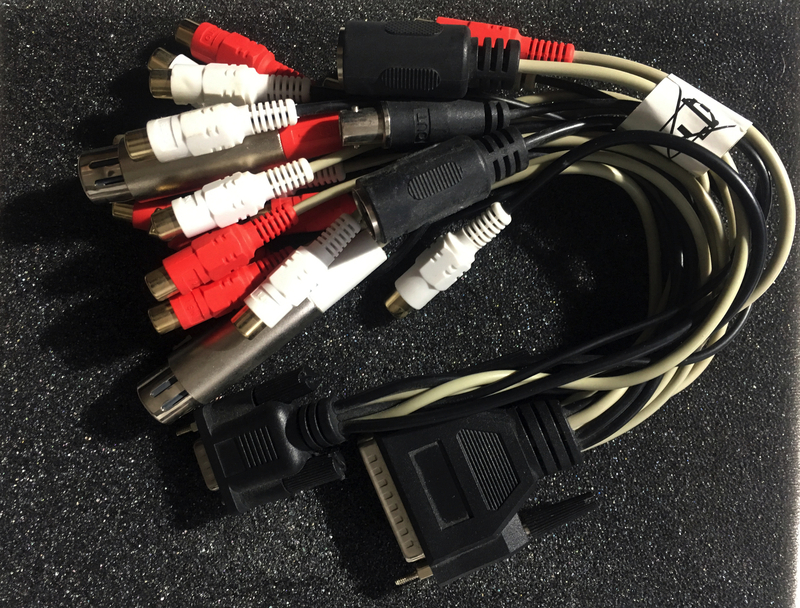 Unlike its big brother the Delta 1010, the LT does not feature its own breakout box, but instead has breakout cables from the PCI card. It's also possible (in theory) to link and synchronize two Delta 1010 LT's. There is some latency, but this may be due to my computer being older. I know latency is an issue with digital recording, which is one of the major reasons why I generally record on analog equipment. The install is relatively simple, just follow the included instructions if you have any questions. I didn't really have any software or hardware conflicts, but I am running Windows XP Service Pack 2, so other operating systems may or may not have issues. That being said, I did at one time attempt to link two Delta 1010 LT's but was unable to get everything to work simultaneously. I eventually lost interest and returned the second Delta 1010 LT. This is a good card for someone that wants to do some decent recordings with their computer. My first recordings ever were on computer... If I could start all over again, I would have taken the money and either bought a decent reel to reel setup with a mixer, or even a standalone DAW such as the Tascam 788 because of their low cost now and ease of use. I still could have transferred my sound files from a machine like the 788 into the computer, allowing me to mixdown in the computer, but I did not know then what I know now. Still, for someone who wants to do everything on the computer, and doesn't care about the potential for crashes, interrupted recordings, jitter, latency, and all the other crap that comes with recording on a PC, this card may be for you. M-Audio has always been one of the leaders in creating affordable and fairly nice interfaces. They also make cards for those who don't want to deal with a separate box. This features an 8 x 8 analog IO with 2 mic pres, S/PDIF with 2-channel PCM, special copy protection, supports AC-3 and DTS pass-through, has MIDI, can control 7.1 surround audio, has 36-bit DSP mixing/routing which is done internally, can switch between consumer and professional/line level gear, contains a world clock for proper I/O syncing and even includes Ableton Live Lite. I was never a huge fan of these interface cards. My biggest gripe about them is that they always have some sort of breakout cable to get all the features of the device. You simply can't include all these features without some sort of multi pinout breakout cable. First of all, they strain the actual connector because of all the devices hooked up to them. This can cause wear over time, although most of them seem to have combat this. The cables themselves are a bit flimsy, so there's also that issue. Finally, it becomes a tangled mess, and switching stuff on the fly is a bit more difficult for me than if there was a central device in one area. The device is very easy to use. Install the drivers, hook up the correct devices and you're good to go. It should work with just about any DAW and roughly any computer that has the appropriate computer port. I never read the manual, but I didn't feel there was a need to since it's a pretty straight forward install. Everything is simple to setup, so no issues there. I'm not a huge fan of the breakout cable aspect of this device. It's the #1 thing that kills it for me. However, the device itself sounds great, and the mic pres are fairly clean sounding. It has tons of features packed into a small device, so if you're into the whole PCI card interface thing, it's worth checking out. Super Cinci's review (This content has been automatically translated from French)" a very good sound card 8 8"
That motivated me: 8 inputs, 8 outputs. two years later, I bought a second to enter the 16 tracks (€ 200 this time, the price has fallen strangely). We can put up to 4 in the machine! I use it on the live-out mix for multi-track recording. Both cards have three consecutive PC, they still turning. Side tone, nothing to say, if he sends enough signal, you will not breath. drivers super stable once properly configured. The multiplayer map is hard to take control early, but we had to think of sync! M-Audio continues to develop the drivers, it's a good thing! My two cards running in 16/88.2K, 16 tracks and spend carefree. latency, I do not care, it is the analog reccording! No, this is the first multi-track card that I made, and I'll maybe take a third one of these days, but it will also take a large hard-drive!